Buy gift cards for your friends, colleagues, and loved ones in any whole dollar amount. With our diverse programming lineup—wine classes, spirits tastings, hands-on cocktail classes, & more—you can be sure there is something for everyone on your list! To purchase a gift card, fill in the dollar amount and add the card to your shopping cart. After you check out, we’ll ship the card directly to you in 3–5 business days. We ship cards directly to the gift buyer to avoid the risk of loss or confusion in delivery. Gift card delivery requires an adult signature. All gift cards have a flat $5 shipping charge regardless of address or number of cards purchased. The recipient can use the card at any time for any Astor Center class or event they wish. Gift cards do not expire. 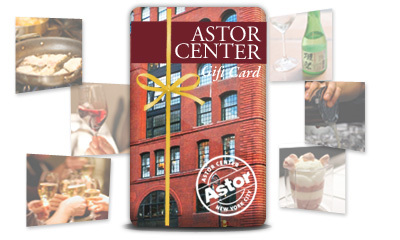 Astor Center gift cards can only be used towards the purchase of Astor Center classes and events. They cannot be used for any purchases at Astor Wines & Spirits. We ship the cards directly to the gift buyer to avoid the risk of loss or confusion in delivery. Gift card delivery requires an adult signature. All gift cards have a flat $5 shipping charge regardless of address or number of cards purchased.